Chances are, you’ll pull over the page on that 2017 calendar and another empty March will be staring blankly back at you. The Christmas holidays are a thing of the distant past and your calendar is daring you to do something. Well, if another placid beach holiday doesn’t sound as appetising this year, it’s probably time to get active and explore Costa Rica. The country bursts with life during March and April, as animals, plants and people emerge from their sun-deprived states to bask in what has to be the country with some of the most exemplary weather on the planet during these months. Here’s five reasons to write ‘leave for Costa Rica’ in your calendar this March or April. With the dry season coming to an end, you might imagine Costa Rica at the end of April to be one gigantic, flooded swamp. You’ve heard of those tropical wet seasons and you want no part of it. Luckily for you, there’s a very definite defining point before the dry and the wet, and it doesn’t happen until May and occasionally, June. This means all of Costa Rica’s remarkable beauty in March and April is still firmly above water (apart from the magical coral reefs, which remain tenaciously below). These are also the months with some very toasty and prevalent sun – the hottest of the year in fact. Highs can reach 37 degrees and lows are a comfortable 25 degrees, while the sun finds itself almost entirely uninterrupted by cloud. Pure bliss. March sees a spike in activity for the wildlife in Costa Rica, spurred on by the emerging sun, to get some serious work done on their tans. The most notable stirrer and possibly the country’s most beloved is the sea turtle, who returns from nesting in March and can be found all along the country’s Pacific border. The sight of hatchlings struggling out of the sand and into the sea is one that should not be missed. Riding the waves alongside our cute, scaly friends are humpback whales, who feature in both Pacific and Atlantic seas. The quetzal is a stunningly beautiful bird that, in April, begins the process of building its nest in the eerie surrounds of the equally stunning cloud forest. 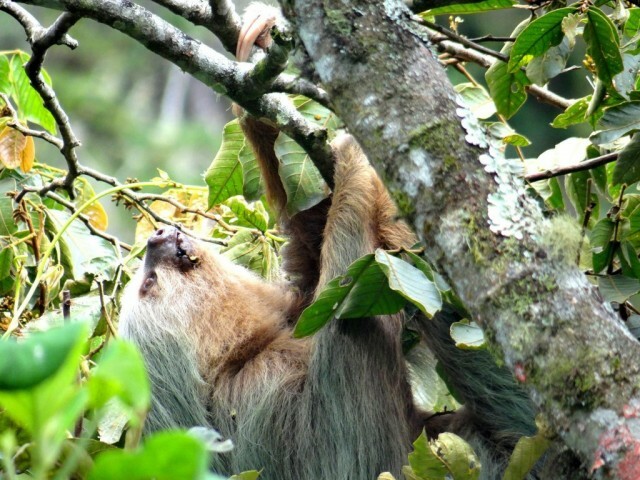 There is also a wealth of resting wildlife in the form of monkeys and everyone’s favourite slowpoke, the sloth, both of which like to take shaded refuge from the heat, meaning morning strolls around Costa Rica’s forests can be very eventful. 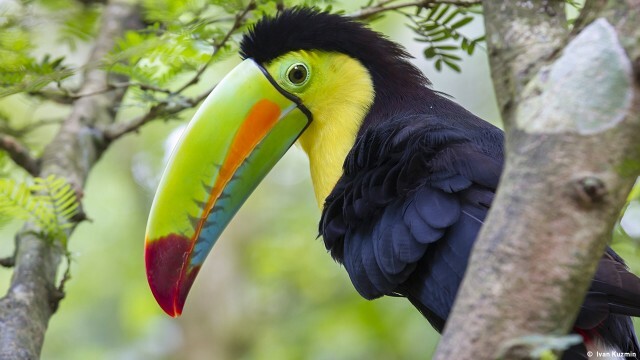 Not to forget the colourful and iconic toucan. Join the humpbacks on the waters in March, as peak waves in the Atlantic wash up consistently on the country’s northern beaches. These can be some fairly gnarly swells (surfer talk for ‘large waves’), so the less inclined but still eager can head to the southern beaches and the much milder waves of the Pacific, which are great for beginners. There are also a multitude of on-land activities for anyone who can’t get their sea legs. Zip lining and mountain biking are especially popular in March when the sky is at its clearest and breathtaking views of Costa Rica’s valleys will be most memorable. Sweeping vistas are pretty consistent backdrops whilst flying down any of the country’s many single-track trails. Hidden spots abound if you buy the right local the right drink. If you’re after that postcard-perfect image of a loud, garish Costa Rica, then March will grant it in bundles. The National Orchid Exposition is presented in San José at this time and it’s an absolute flourish of colours and smells from possibly the most photogenic blossom in the world. You’ll probably even catch a glimpse of the treasured, yet endangered national flower, the guaria morada. The grand and statuesque bloom alongside the small and delicate in March and April, as the flamboyant marinche and cortez amarillo trees spread outwards in a gracious display. Alongside these are the 825 different ferns of the cloud forest and a wealth of fruit-bearing trees that make up some of Costa Rica’s delectable Caribbean-infused food. For full splendour points, Costa Rica’s utterly diverse climates are best experienced at the time when you’d most prefer to be outside, i.e, March and April. 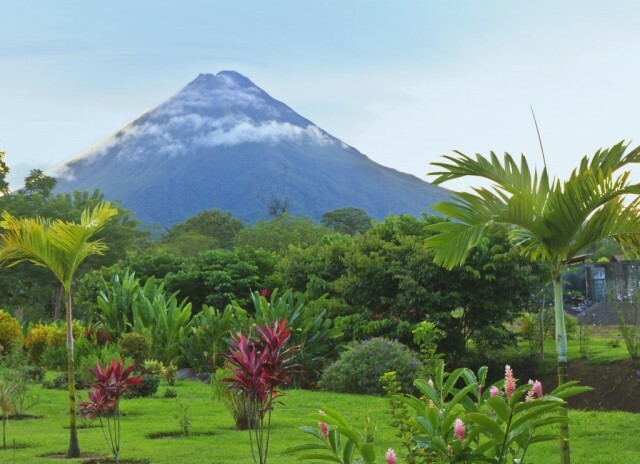 The magnificence of the Arenal Volcano punctures the deep blue sky with its perfect, sculpture-like cone, whilst the colours that surround it reach maximum vibrancy. The Monteverde cloud forest is as beautiful as ever, providing some misty relief from the heat, and its fusing of two weather systems at the Continental Divide is a phenomenon not to be missed. The crashing Victoria Falls and smoothly-descending Cangreja Falls are fantastic spots to witness both the power and beauty of nature in this country of effervescent energy. Sound appealing? You can jump on Headwater’s walking tour of Costa Rica in March or April for an inside look at one of the world’s most beautiful countries during its warmest months.